The civil rights movement had Martin Luther King Jr., the feminist movement had Betty Friedan and the animal welfare movement has Jane Goodall. At Loyola High School on Friday, the acclaimed 80-year-old primatologist, ethnologist and anthropologist recounted to Concordia University students her experiences reforming a field that, orginally, discounted the idea of animal intelligence. Goodall had named the chimpanzees she had observed in Tanzania’s Gombe National Park, rather than giving them numbers. Senior scientists at Cambridge University, where she was working towards her PhD in ethnology, told her that her methods were wrong, but she continued giving the chimpanzees names. Goodall went on to tell the audience about an octopus named Athena in the San Diego zoo. After fish had disappeared from their tanks without a trace, zookeepers set up a camera to record the area at night. Athena had been crawling out of her tank, across the floor, into the fish’s tank, eating a few fish, and crawling back into her own tank. 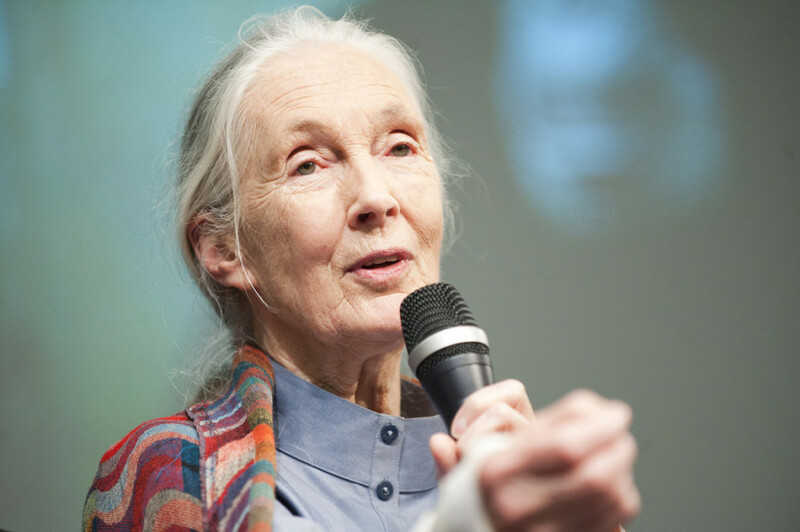 “We are not the only beings on this planet with personalities […] and emotions,” Goodall said. Goodall explained that although observing chimpanzees was her ideal occupation, she had branched into animal rights when she “realized chimpanzee numbers were plummeting” as a result of deforestation. In the early 1990s, she flew over Gombe National Park and was shocked by the deforestation she saw in all directions. People were overusing the farmland until it became infertile. To address the issue, Goodall started the Take Care program. With a team of local Tanzanians, she asked villagers how they could improve their quality of life and how she and her team could help make over-farming unnecessary. As a result of the program, the farmland in 52 villages has been restored and their forests protected. In 1991, Goodall formed the Roots and Shoots program, which involves children and young adults in environmental advocacy. Goodall also spoke extensively on climate change and the impact it had around the world. “Along comes climate change, with these so-called greenhouse gases […]. We have so polluted air, water and land, running off into the rivers and the ocean, that areas of ocean are becoming acidic, and cannot absorb CO2 the way they used to,” Goodall told students. “We seem to be bent on destroying this beautiful planet and it’s really sad. Everybody knows that the reckless burning of fossil fuels is adding to the greenhouse gases; just go to Beijing,” she added. Goodall also explained the negative impact of the animal processing industry in detail. According to Goodall, that means raising millions of animals, leading to consolidated farms. “As the animals are fed slightly richer food than they normally would have, to make them grow quicker, their digestion is producing more and more methane gas—what you get from the process of digestion in people. I don’t know a polite way of saying it, but you know exactly what I mean,” she said through the crowd’s laughter. “Methane is a far more potent form of CO2. […] These animals have to be routinely fed antibiotics […]. These antibiotics are getting out into the environment and the bacteria are building up as well, and people have died from a scratch on the finger,” she said. Arrien Weeks of Sustainable Concordia thanked Goodall for appearing at the university in the week before her 80th birthday. Weeks spoke about the recently posed referendum question about the division of fee-levy groups per faculty, and said that by voting down the measure, the Concordia student body had preserved the work of fee-levy groups like Sustainable Concordia that allow speakers like Goodall to visit. “By taking this initiative, Concordia students have shown a remarkable commitment to sustainability,” he said. When asked who her role models were as a child in the question period following her talk, Goodall responded that her primary role models were her family and early explorers. “When I read about the early explorers, I felt envious—that’s what I wanted to do,” she said.